Alison Brooks Architect’s exhibited a unique architectural model at the Royal Academy of Arts’ 250th Summer Exhibition. 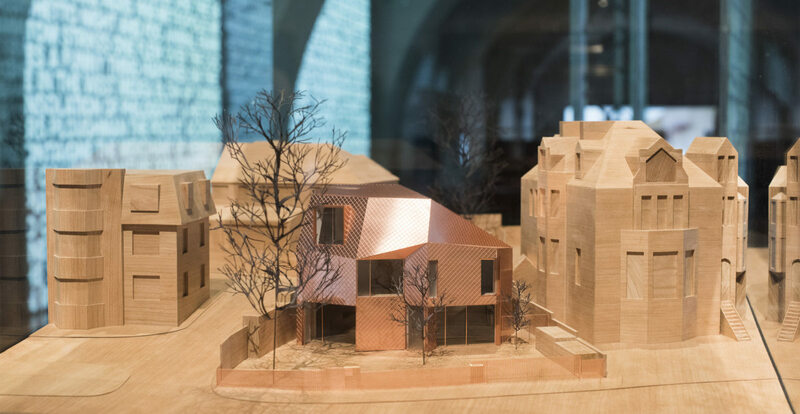 The model, crafted using cherry wood and copper is of our private residential project ‘Mesh House’ in London. Nearing completion, Mesh House is an organic, crystalline form that wraps itself around an outdoor court yard. Each plane of its faceted copper surface – wall and roof planes, are tailored to allow sunlight from the south to reach every room in the house, to allow maximum light into neighbour’s windows, and to maintain the overall rhythm and form of the local streetscape.